Charles-Édouard Chaise (1759-1798), Theseus, Victor over the Minotaur (c 1791), oil on canvas, dimensions not known, Musée des Beaux-Arts, Strasbourg, France. Image by Rama, via Wikimedia Commons. Theseus was the founder of the city of Athens, or perhaps more accurately the person responsible for its early development and growth, and Plutarch’s biography of him was selected for comparison with that of Romulus, the founder of the city of Rome. Even before he starts his account of the life of Theseus, Plutarch makes clear that both Theseus and Romulus were far from perfect gentlemen, with a record of multiple rapes and worse. Yet, for a long time, the life of Theseus was as celebrated a series of myths as those of Heracles, Jason or Aeneas. In about 1340-41, Giovanni Boccaccio wrote a very long (almost 10,000 line) epic poem Teseida, or The Theseid, which in turn inspired The Knight’s Tale in Chaucer’s Canterbury Tales. Paolo da Visso (1431–1481) Scenes from Boccaccio’s Teseida (date not known), front of a cassone, further details not known. Wikimedia Commons. Paolo da Visso (1431–1481) painted these three scenes from Boccaccio’s epic on the front of a cassone – the visual equivalent of Plutarch’s account of the adventures of Theseus. Theseus was the result of the incestuous union of his father Aegeus, the king of a much smaller Athens, with his daughter Aethra. The king justified this with the cryptic words of the high priestess at Delphi, although no one else appears to have interpreted them in the same way. Aegeus then left a sword and a pair of sandals under a large rock, telling the pregnant Aethra that, should she bear a son, then the boy should travel to Aegeus with those items as proof of his identity. Nicolas Poussin (1594–1665) and Jean Lemaire (1598–1659), Theseus Recovering his Father’s Sword (c 1638), oil on canvas, 98 x 134 cm, Musée Condé, Chantilly, France. Wikimedia Commons. 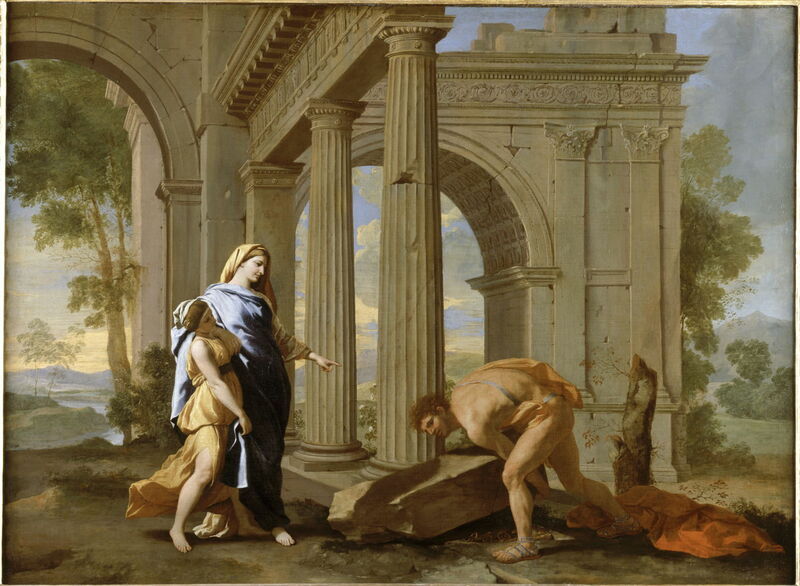 In one of his rare collaborative paintings, Nicolas Poussin worked with Jean Lemaire to show the scene of Theseus Recovering his Father’s Sword (c 1638). They draw a marked contrast between the two actors: Theseus, destined to be a great hero, looks rough and brutish, whilst his mother Aethra wouldn’t look out of place standing in for the Madonna, perhaps. Aethra told her son to take the sword and sandals to his father in Athens, travelling by sea, but he chose to travel overland instead. His inspiration for this was the adventures of Heracles. Like his hero, Theseus had a series of adventures on this journey. He first killed Periphetes, who had wielded a large club at him; impressed by this club, he took it and killed another opponent, Sinis, raped his daughter and made her pregnant. Theseus went out of his way to meet the fearsome Crommyonian Sow, which he also killed. Coming to the borders of Megara, Theseus met Sciron, whom he threw down a cliff to his death, and killed another two people before coming to Athens. Theseus found the city, and his father’s court, in disarray, with the king cohabiting with the sorceress Medea, who had promised to cure his lack of children. Aegeus was still unaware of Theseus’ true identity, but invited him to a banquet, at which Medea acting in conspiracy with the king tried to get Theseus to drink a goblet laced with the poison aconite. Luckily for Theseus, just before he was going to drink from the goblet, he drew his father’s sword, making as if to carve the meat with it. Aegeus recognised the sword, realised that his guest who was just about to drink poison was his son, and knocked the goblet from Theseus’ hand to stop him from touching it with his lips. 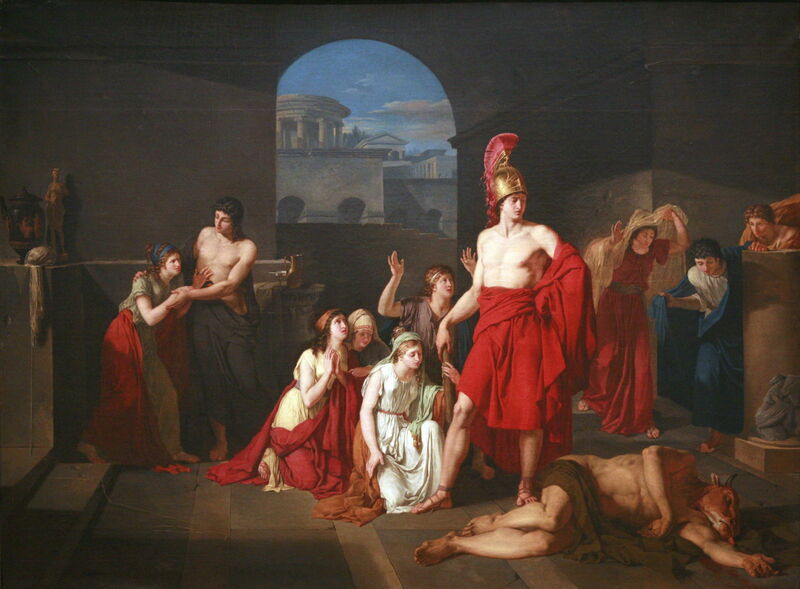 In Antoine-Placide Gibert’s Theseus Recognised by his Father (1832), the three principal actors are arranged almost linearly across the canvas. Just left of centre, Theseus stands, his head in profile, the fateful cup in his left hand, and his father’s sword in his right. The king is just right of centre, looking Theseus in the eye, and appearing animated if not alarmed. At the far right is Medea, her face like thunder, sensing that her plot to kill Theseus is about to fall apart. 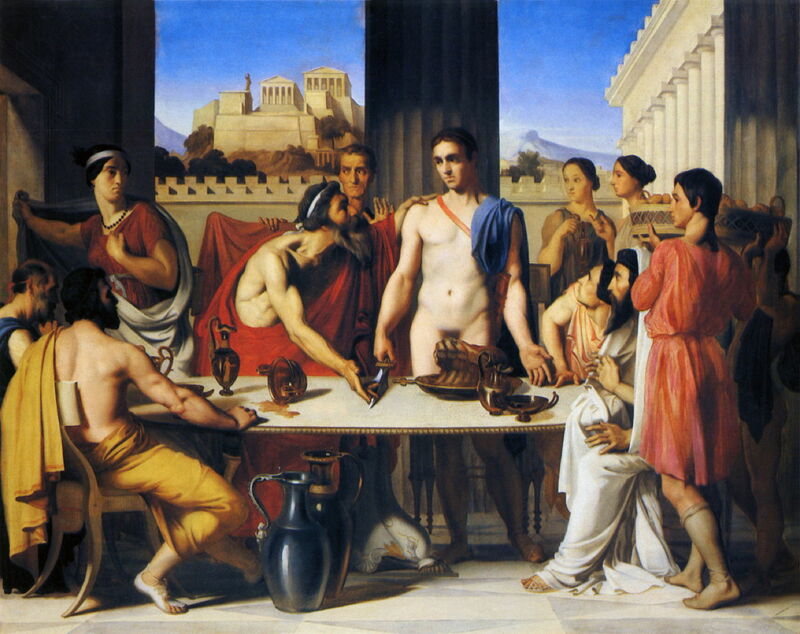 Hippolyte Flandrin’s Theseus Recognized by his Father (1832), which beat Gibert’s painting for the Prix de Rome, has a more neoclassical look, as if influenced by Jacques-Louis David. 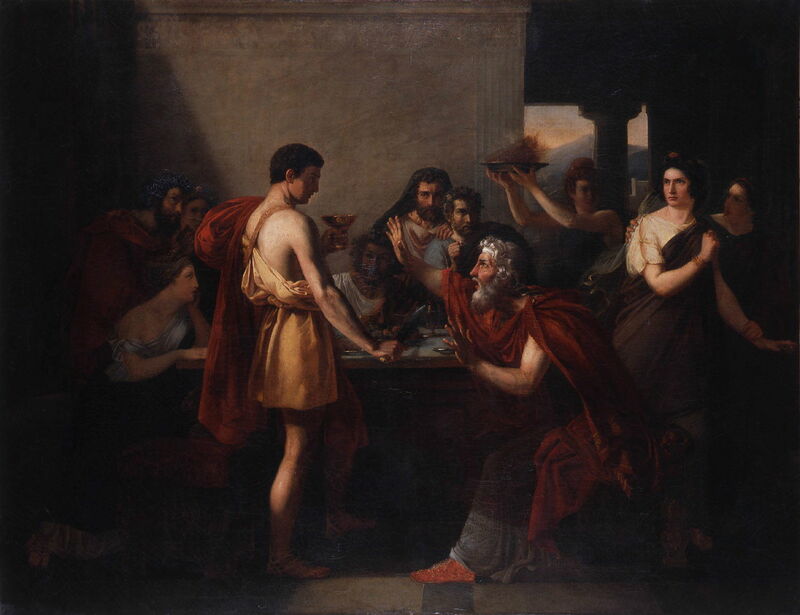 With a view of the Acropolis in the background, this shows the moment immediately after Aegeus has recognised his son, and the cup of aconite lies spilt on the table. Theseus, conspicuously naked, stands in the middle of the canvas, his father’s sword held rather limply in his right hand. Aegeus stands to the left of centre, talking to his son quite emotionally. But of all the characters shown in this painting, it is Medea who is the most fascinating. Stood at the far left, she appears to be on her way out. She is po-faced, and looks as if she has come not from Greece, but from central Asia, perhaps. Aegeus then declared Theseus to be his heir, and successor as King of Athens. This was opposed by the sons of Pallas, who tried to attack the city. Theseus was tipped off by one of their men, surprised his opponents, and killed them all. Like his hero Heracles, Theseus then set out to deal with the problem posed by the Marathonian Bull, captured it, and drove it through the city of Marathon before sacrificing it to Apollo. Theseus’ greatest claim to fame was in killing another bull: the half-bull, half-human Minotaur which lived at the centre of the Labyrinth on the island of Crete. King Minos of Crete had been exacting a tribute of nine young men and nine maidens from Athens every nine years, who were taken to the Labyrinth and died there. On the third such call for eighteen of Athens’ finest, its citizens accused Aegeus of being its cause. Although a matter of dispute as to how he accomplished it, Theseus went to Crete as one of those eighteen. Because the Athenians knew that their young people were not going to return, the ship which carried them to Crete had black sails. On this occasion, though, Theseus gave its crew a white sail, telling Aegeus and the crew that when they returned, if he had been successful in killing the Minotaur, they would set that white sail as a sign. Gustave Moreau (1826–1898), Athenians Being Delivered to the Minotaur (1855), oil, dimensions not known, Musée de Brou, Bourg-en-Bresse, France. Wikimedia Commons. Gustave Moreau’s painting of Athenians Being Delivered to the Minotaur (1855) shows the victims as they were preparing to enter the Labyrinth. Wearing laurel wreaths to mark their distinction and sacrifice, the young men and women hold back while Theseus crouches, waiting to do battle with the beast, seen at the right. Left to his own devices, Theseus’ chances were not good. However, Minos’ daughter Ariadne had fallen in love with him when she saw him compete in the funereal games which had preceded the act of sacrifice, and promised to assist in return for his hand in marriage afterwards. It was she who provided Theseus with a ball of thread which he deployed as he entered the Labyrinth, enabling him to retrace his steps once he had killed the Minotaur at its centre. Henry Fuseli (1741–1825), Ariadne Watching the Struggle of Theseus with the Minotaur (1815-20), brown wash, oil, white gouache, white chalk, gum and graphite on moderately thick, moderately textured, beige wove paper, 61.6 x 50.2 cm, Yale Center for British Art, New Haven, CT. Wikimedia Commons. 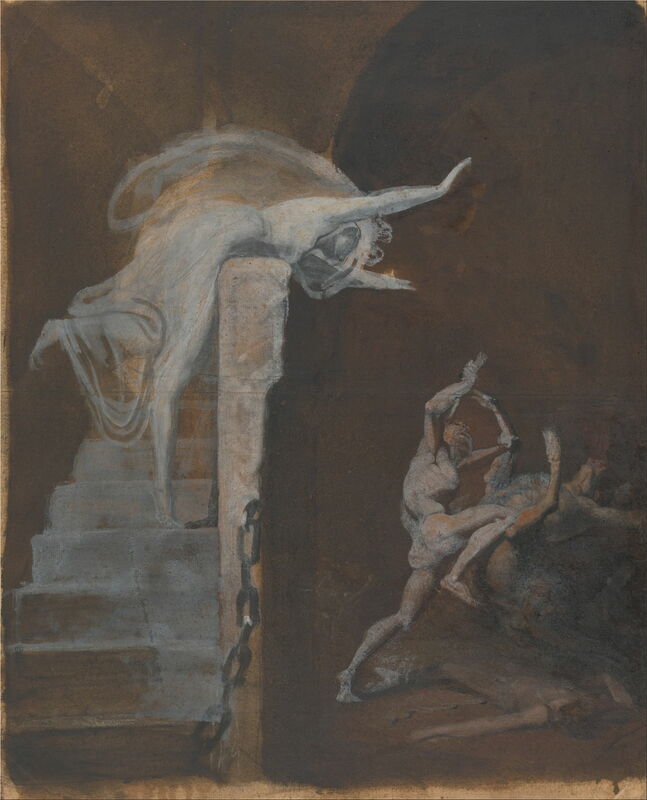 In Henry Fuseli’s spirited mixed-media sketch of Ariadne Watching the Struggle of Theseus with the Minotaur (1815-20), Theseus appears almost skeletal as he tries to bring his dagger down to administer the fatal blow, and Ariadne looks like a wraith or spirit. Theseus, Victor over the Minotaur (c 1791) is one of only three paintings by Charles-Édouard Chaise known to survive. With its crisp neo-classical style, it shows Theseus standing in triumph over the lifeless corpse of the Minotaur. He is almost being mobbed by the young Athenian women whose lives he has saved. At the left, his thread rests on a wall by an urn, which suggests that the young woman by it may be Ariadne; she is being helped by a young man. In the next article, I will conclude my summary of Plutarch’s biography of Theseus. Posted in General, Life, Painting and tagged biography, Chaise, da Visso, Flandrin, Fuseli, Gibert, history, morality, Moreau, painting, Plutarch, Poussin, Theseus. Bookmark the permalink.